1. Preheat the oven to 375F degrees and Oil a round cake pan with coconut oil and line the bottom with parchment. 2. Whisk flour, baking powder, baking soda, sea salt in a large bowl and blend well. 3. Place dates, reserved water, almond butter, water, matcha, and vanilla extract into a blender, and blend until smooth, then whisk the mixture into the flour mixture until well blended. Whisk in the cider vinegar until bubbles form. 4. Pour the cake batter into prepared pan, and place in the oven. 5. Bake cake until set and a toothpick inserted into the center comes out almost clean, about 25-30 minutes. Remove from oven, let cool completely, then unmold onto a plate. 6. To make the Topping, whisk together the coconut milk, matcha, maple syrup and vanilla. Brush this over the cake until it's soaked in the topping. 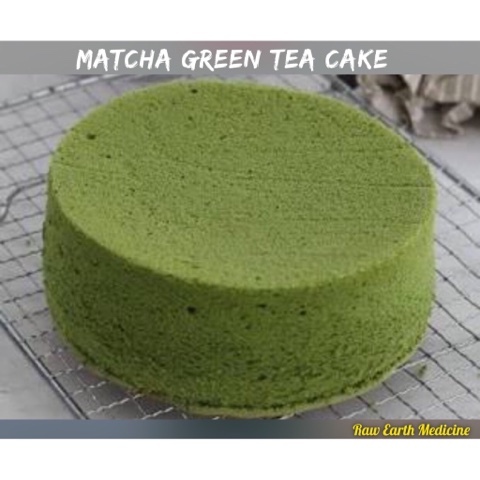 This delicious cake is full of Matcha goodness! It has such a sweet unique flavor and soaking the cake in the topping gives this cake a melt in your mouth texture and a very delicious taste! Enjoy!